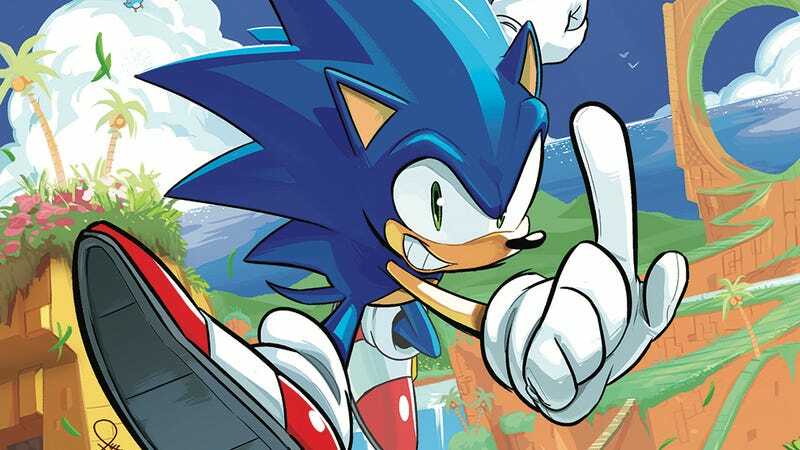 After nearly 300 issues at Archie Comics, the Sonic The Hedgehog comic is getting relaunched at IDW. But other than the numbering and the publisher, not much else is changing for the spiky blue speedster. Ian Flynn is sticking around as writer, and he’s joined by a lineup of veteran Sonic artists for new issues released each week in April: Tracy Yardley (#1), Adam Bryce Thomas (#2), Jennifer Hernandez (#3), and Evan Stanley (#4). Sonic’s arch-nemesis, Dr. Eggman, may have disappeared after their last showdown, but the villain’s robot army is still roaming the world, causing trouble for the adorable animal population that Sonic has sworn to protect. And the attacks are becoming more organized, suggesting that their old master has either returned or there’s a new threat taking advantage of the deadly machinery to further their own evil agenda. This exclusive preview of next week’s Sonic The Hedgehog #1 shows Sonic rushing into battle to save a village under attack from these mechanical soldiers, and it spotlights how well this creative team captures the dynamic energy of the Sonic video games. Speed is essential to Sonic’s appeal, and Tracy Yardley’s artwork with inkers Jim Amash and Bob Smith and colorist Matt Herms captures the rush of the hedgehog in action. The artwork is full of character, and Sonic has the swag of a superstar celebrity, totally confident that he can stop whatever gets in his way and taking time to toss a wink and finger guns at his adoring fans. Much of this first issue is Sonic taking out these robots, later joined by his best friend, Tails; this emphasis on action make for an exciting debut as the series settles into its new home. Was Sonic The Hedgehog too fast for his own good?